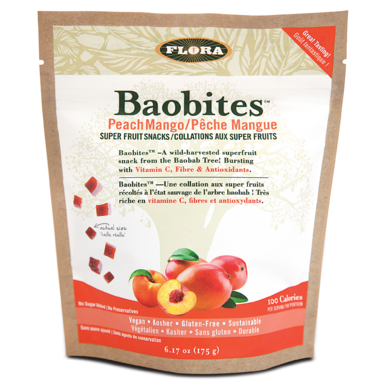 Baobites Super Fruit Snacks provide a delicious way to enjoy the nutritious benefits of baobab. Baobab is a wild-harvested super fruit from the baobab Tree, naturally bursting with fibre, electrolytes and antioxidants with six times the vitamin C of oranges! These flavour packed fruit bites are made with 100% pure, organic baobab fruit powder and fruit concentrates and have no fat or preservatives. Ingredients: Apple juice concentrate, organic baobab fruit pulp powder, peach juice concentrate and puree, mango puree / juice concentrate, rice bran, turmeric, red beet, vegetable oil (coconut or safflower), pectin, calcium ascorbate, natural flavour. If youâ€™re looking for something peachy and chewy to tame your sweet tooth, these are for you! These are the cute small fun snack. Very flavorful. Will buy again. Preferred the blood orange and pomegranate flavours. This batch, unfortunately, had hardened. Normally they are chewy when fresh.